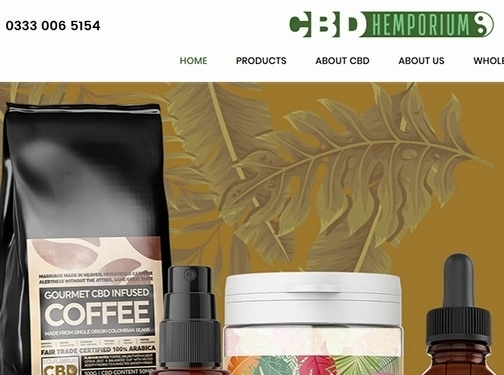 CBD Hemporium Ltd is a family owned business that strives to produce safe, organic and fully tested CBD products to improve everyone's daily quality of life. Our aim is to help people benefit from the effects of CBD oils within your life by using it as a daily complementary supplement. All our organic whole-plant based oils contain no THC and will not get you high and are LEGAL to use in the UK. We are proud that our ALL our products are full spectrum hemp oils, which allows you to benefit from the necessary phytocannabinoids to enhance your well being. Our products are 100% grown free of pesticides, herbicides, GMOs and heavy metals with the added benefit of solvent-free product extraction. UK (Lancaster) based business providing CBD (Cannabidiol) products for sale. Website includes e-commerce facilities, delivery and returns information, terms and conditions, associations, full contact details including company registration number.